Note: "Thirteen-year-old Muchoki and his younger sister, Jata, can hardly believe what has become of their lives. Only weeks ago, they lived in a bustling Kenyan village, going to school, playing soccer with friends, and helping at their parents' store. But sudden political violence has killed their father and destroyed their home. Now, Muchoki, Jata, and their ailing mother live in a tent in an overcrowded refugee camp. By day, they try to fend off hunger and boredom. By night, their fears about the future are harder to keep at bay. And then the unthinkable happens: their mother dies and they are left orphaned. 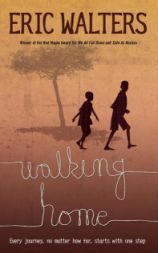 Driven by a desperate optimism, Muchoki and Jata set off on what seems like an impossible quest: to walk over a hundred miles across Kenya in search of their last remaining family"--Back cover. This story is about Muchoki, a thirteen-year-old Kenyan boy and his younger sister, Jata. Together they make a long journey in search of their mother’s family. They have just lost their mother to malaria in an overcrowded refugee camp and not long ago they lost their father and all other paternal relatives to political violence. Lacking money, they walk a long distance across Kenya, from the western part of the country to the east. Although they are often afraid of strangers they meet on their way, these strangers turn out to be very kind and supportive. Some give them money, overnight shelter, food, security etc. Finally, they coincidentally meet their uncle who introduces them to their grandparents and other relatives. It is a bittersweet reunion because the grandparents learn that their daughter is no longer alive. Grandfather welcomes them to his home which he refers to as their home. The novel illustrates several themes. First, that every trip begins with one step! Although Muchoki’s and Jata’s trip was over a hundred miles, they had to begin with just one step! A second theme is the role of a big sibling especially in the absence of parents. When their ailing mother dies, Muchoki assumes the full responsibility for his younger sister. It is through his care and guidance that the two siblings find their maternal family. Third, the book illustrates the consequences of political violence i.e. the loss of lives, ethnic conflict, destruction of property, displacement of people, and the most devastating effect of all for children, emotional imbalance. No one knows when Muchoki and Jata will ever recover emotionally. Also commendable is the author’s use of figures of speech to convey his message (e.g. personification, similes, imagery, and metaphors). Another plus is his weaving of the Kamba people’s legend of an invisible string that is believed to guide the Kamba people back home irrespective of how far they are from home. Walters uses this imaginary string to symbolize hope that Muchoki and Jata will find their only living relatives. Finally, the author brings the text alive by incorporating symbols for photos, maps, readings, and videos that connect to author’s website. Unfortunately, the author’s use of the word “tribe” and identification of each of his characters by their ethnic affiliation is quite disturbing, particularly in view of the political and ethnic tensions that Kenya has experienced. National identity would have been more relevant in this context. Also troubling is the stereotypical depiction of Africa. As in his book My Name is Baraka, Walters perpetuates stereotyped Africa devastated by disease, poverty, political violence, and ethnic tension. He misses many opportunities to balance his story. For example, when Muchoki and Jata trek through Nairobi, Walters could have allowed his readers to see some of the more affluent neighborhoods in the city and its environs. Instead his two travelers go through Kibera, one of the biggest slums in Africa. Children should read this novel after they have been exposed to other novels that give a more balanced view of Africa.